Home » Blog » How to make your first $500 from your Fiverr copywriting business! 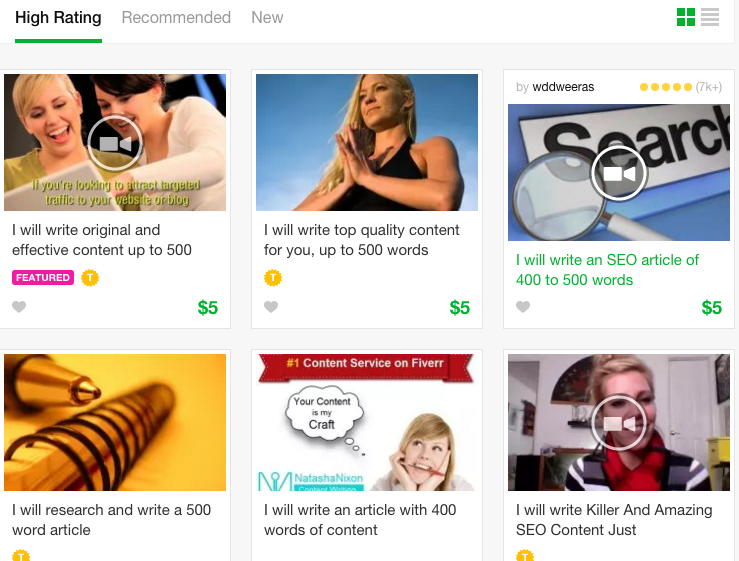 How to make your first $500 from your Fiverr copywriting business! Learn how you can earn an income online by working from home or as you travel by doing copywriting jobs on Fiverr. Sign up and register yourself on Fiverr. Setup your copywriting service offerings on Fiverr. Tips with creating your gig. Getting leads from people finding your gig listing through Fiverr’s organic search. Finding businesses that are actively looking for your services. How to increase your Fiverr revenue. Don’t be afraid to upsell or cross-sell. 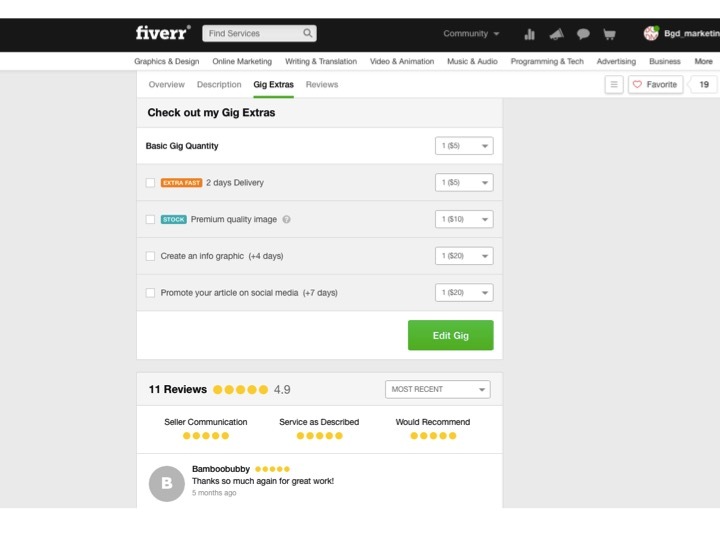 Some takeaways to give you a more competitive edge with your Fiverr listings. Make sure your profile and gig listings come across professional. Guard your reputation with your life! Maintain a visible online presence. Handy resources to help you build your Fiverr copywriting business. Fiverr is a great platform. I would like to tell you how I managed to develop a small copywriting business simply by using Fiverr. I will tell you the strategies I used to find clients that any aspiring copywriter can use. I no longer sell my services on Fiverr, as I now charge higher prices for my article writing services. However, I would like to share the methods I used to gain initial success when developing my Fiverr copywriting business. If you know how to write, then you can achieve this relatively quickly. So without any further ado, let’s get into how you can develop your Fiverr business and start making money from your writing now. Visit Fiverr to sign up and start offering your services. You can sign-up by registering your email address or connecting your account to Facebook or Google+. If you are already a member, sign into the website. Adding a good, professional photo of you on your Fiverr profile. Verify your profile via email. Craft a short pitch that explains the benefits that you offer. For example, I am (name) and I write 500 word SEO articles that are Google Penguin Friendly. 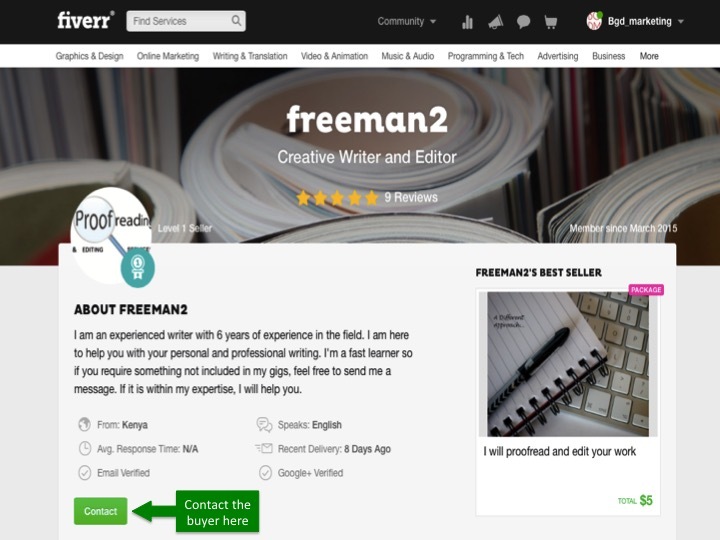 Example of a Fiverr Profile. 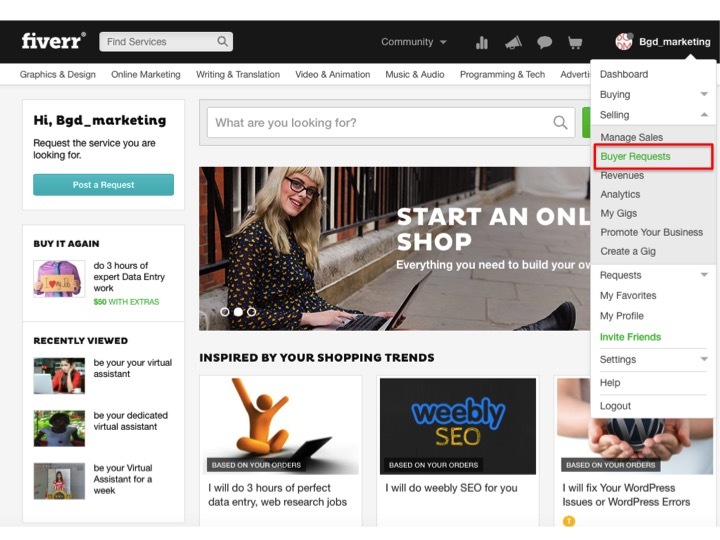 To create a service offering on Fiverr, you need to create a gig that will share your offer. People will be scrolling through the gigs on offer and you will get only a few seconds to capture the attention of your prospect and to get them consider your gig listing. To maximise the opportunity, we recommend that you do the following. Create a compelling headline that is specifically targeted to the customer prospects that you are targeting. 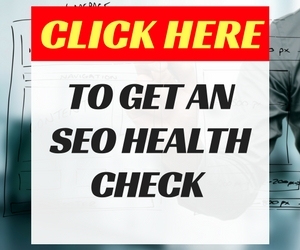 For example, I would use the title “I will write 1 interesting SEO article or blog post”. Select an interesting picture. I strongly recommend that you stick to photos and steer clear of animations. Photos offer a greater sense of professionalism. Use the photo image with text that sells your service. I would use a photograph of a notepad that said “Tell your story”, which seemed to work well for me. 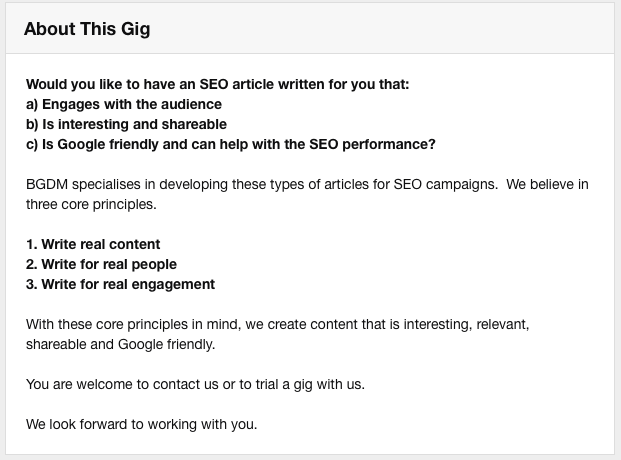 An example of a copywriting gig listing on Fiverr. 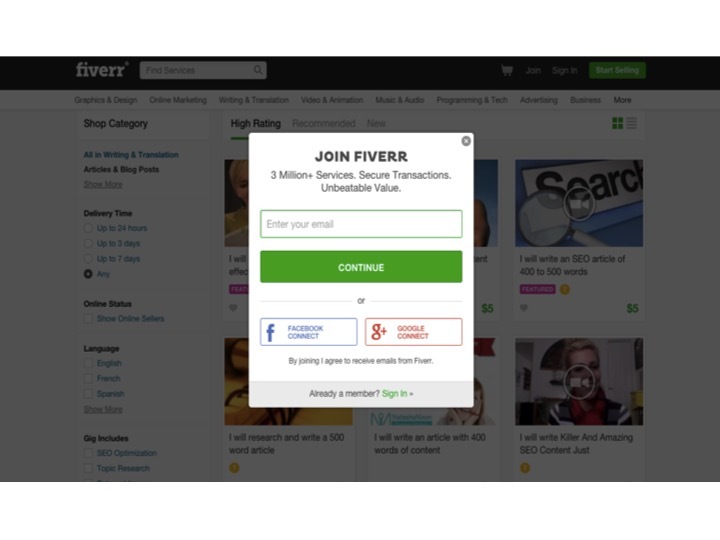 Within the Fiverr website, they give you embed codes to publish your Fiverr profile onto other websites. They also give you links to share on your social media profiles. While this is a good initiative, I didn’t achieve much success by using these. 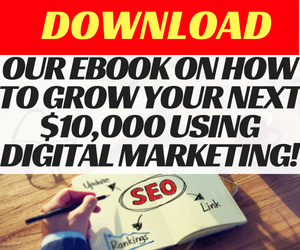 I found that you needed to create and nurture leads on Fiverr. I accomplished this in the following ways. This is based on the ranking algorithm on Fiverr. I found that when I first uploaded the gig, I was able to receive inbound enquiries organically. I believe this was because they featured the new listing. After a few days, the listing dropped in visibility due to the competition. Over the course of one month, I saw the competition increase dramatically in the natural search results on Fiverr for copywriters. It is important to get your listing to appear on the first page results on Fiverr otherwise you won’t get the traffic. The only way I succeeded at doing this was by creating a new listing. This was the method that I used the most to get my success on Fiverr. You can go onto the tab for buyer requests where you can see what services people actually need. With this function, you are limited to ten requests per day on one account. 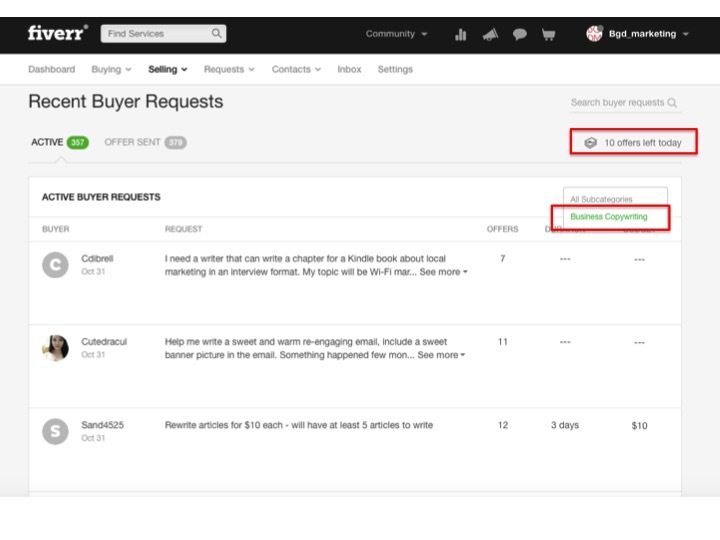 You can filter the list by copywriting in the buyer requests section. You must have an active gig to pitch in the buyer requests section. 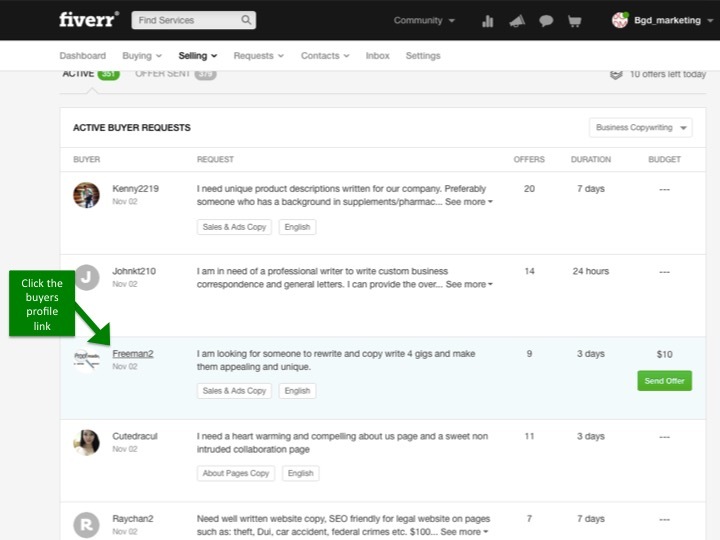 Fiverr buyer requests – Where you can actively seek buyers that are looking for copywriters. You should be able to see the filter on the right hand side of the screen. You should also be able to see that you can send 10 offers of your gig. All you need to do is scroll through the listings once a day and send up to ten gigs. I found that many of the older listings get neglected after a few days. By recontacting them, I tended to have little competition and was able to close their business with a custom offer relatively easily. You can find buyers wanting to purchase your gig in the buyers request section of the website. You can pitch to 10 buyers per day. One of the frustrating things with the buyer request is the 10 offers limit that you have each day. One way I was able to get around this was by clicking on the profile links of those people that would advertise in the buyers request section and send them a direct mail. This would only work if the person had their contact details available. I found it to be a good conversion method. I personally had a good success rate with this. All I did was do some data collection to find agencies (in this case, SEO agencies) that required copywriting services. I knew that by targeting SEO agencies, they would need to order articles in bulk (e.g. 10 articles or more per month). I also knew that it would be easier to upsell or cross-sell to them, hence earning me more revenue. I would start by finding a list of 50 locally based agencies. I would find their general enquiry email address or note that they had a web form. I would then send them the following email. That was it. A simple introduction email that would create the opportunity for people to find and purchase my Fiverr gig. I had some success on Twitter when searching for prospective Fiverr clients. I would achieve this in the following ways. I would publish tweets that would have a link to my Fiverr gig. I would aim to get people to favourite and retweet the link in order to get more inbound enquiries. This did create the opportunity for enquiries, but it was a slow process. The tweet message needed to be compelling and use the correct hashtags to increase your tweet’s visibility. You can see examples of the tweets below. I would look for people on Twitter that are searching for copywriting talent. I would achieve this by typing into the Twitter search box “looking for copywriters” or “copywriting” or “freelance copywriters”. You can work with different variations that will allow you to see different results. 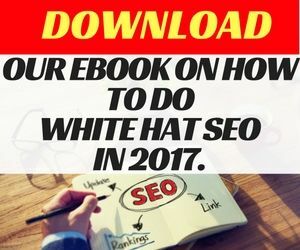 Once you have put this in, you should get results that show you copywriting jobs and contacts to pitch your Fiverr copywriting gig to. You can then pitch your gig via Twitter or try to contact them via email. Selling single gigs on Fiverr is encouraging, but you need to sell a lot if you want to start generating a lifestyle income for yourself. You need to accomplish this by increasing the volume that you sell by selling in bulk and by getting repeat purchases. The most expensive acquisition will be that of getting the customer the first time. The repeat purchase is where you will start to see the fruits of your labour rewarded. Treat your initial sale as a promotional sale and then aim to upsell your services with bulk sales that repeat at a regular frequency. This should see your Fiverr gig’s sales income grow exponentially. Upselling to include images or videos in your content. Sell extras on your gig to earn more income. When pitching to new clients, there will always be some form of risk for them. To minimise that risk, you need to offer guarantees that will boost their trust in you. Accomplish this by fulfilling the promise in what you said you will deliver. For example, deliver a good quality 500 word article. One of the experiences that you should prepare to manage is when disputes arise from the work that has been delivered. If a dispute has been raised, it puts you in a position where the buyer can refuse to pay for your services. My recommendation is to try to resolve the issues by clearly defining what the client feels hasn’t been delivered. If the problem is from the client and not a result of your work, it is better to write off the costs and to move forward with the next project. You need to set a clear goal for what you want to achieve from Fiverr. My original goal was to generate leads on Fiverr through a cheap product offering (five dollar articles) and then to upsell or cross-sell other product or service offerings via a custom offer. The specific goal I had was to hit a revenue target. My long-term goal was to achieve a cashflow of $2000 per month. If I wanted to achieve that goal through Fiverr.com, I would need to produce 400 articles a month at $5 each. This would also mean that I would need to close 400 sales and have a pipeline of prospects of around 1000. These targets were clear for me to use in order to work towards my goal. If you want to make your first $500, you will need to make 100 Fiverr sales. To make it easier to achieve, I would provide custom offer services that would increase my revenue. This way, I could achieve more sales revenue towards my goal. Your money is held in escrow. If you have a dispute with a customer, there is a risk that you may not receive your money. When you withdraw your money, Fiverr will take 20%. This means for every $5 gig, you will receive $4. There will be Paypal fees that you will incur from your bank when you withdraw the funds to your bank account. People want to hire experts. If you look like amateur, then it is unlikely you will receive enquiries. Your profile and gigs must be able to sell themselves and give the prospective customer the confidence to purchase your gigs. The ongoing success with your Fiverr business will be impacted by the positive feedback and testimonials that you receive. Aim to deliver high-quality work that will exceed your customer’s expectations. You need to aim to maintain a positive feedback score as close to 100% as possible. Positive testimonials are essential, so give people a reason to say something nice about you. If things don’t work out on a project, write it off and move onto the next project. It is better to lose $5 on one project than to lose the equivalent of $5000 over the long-term. Fiverr reviews will be the lifeblood for your success. Do everything in your power to maintain a strong reputation on the platform. Always try to maintain a strong presence by communicating with your customers. Keep the score high to boost their confidence and dialogue with you. Keep your presence visible with quick and complete responses. The quickest way to prevent the success of your business is by failing to meet the deadlines that you set for delivery. Set a timeframe for which you know you will deliver the project. Remember, that your business will grow exponentially over time if you have followed the guideline carefully and implemented the necessary steps to develop your copywriting business. There are also other good resources to use as a reference for developing your Fiverr.com business. I have listed these below. How to find clients, build a portfolio and start charging big bucks on Fiverr. A guide by Liudas Butkus on Matt Woodward’s blog, detailing how to do business development on Fiverr.com. 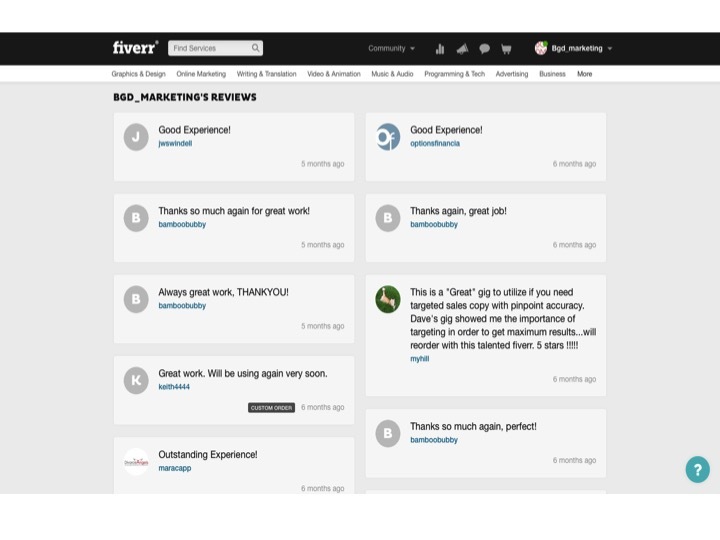 You can join many others who have shared in the success from Fiverr. You can read a few of them below. Redd Horrocks was able to develop her Fiverr business which now allowed her to earn in excess of $9000 per month. Kimberly Palmer covers the story of Micha Kaufman and Morissa Schwartz and their success on Fiverr. Guys making money part time from Fiverr. Damian Pros details how to people make money from Fiverr.com. 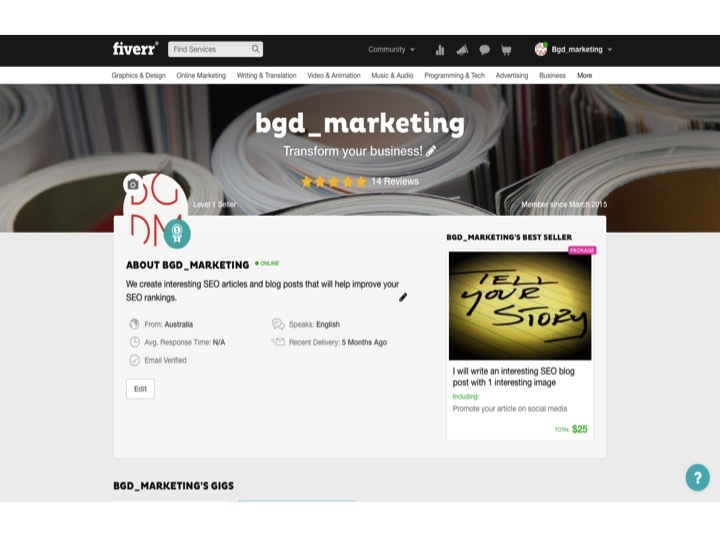 This guide should allow you to start making an initial income from Fiverr.com. The steps I provided are the exact steps I used to start my Fiverr business and allowed me to start earning an income as a copywriter based in Australia. I have now stopped my Fiverr business, as I was able to generate a higher income from copywriting off Fiverr. Had a chosen to continue with Fiverr, I would have expected to earn a monthly income between $500-1000 per month. I’m confident that if you want to earn a lifestyle income from Fiverr, you can achieve it with the steps provided above. Best of luck with your Fiverr copywriting venture. Your Guide contains everything that will help to be a Fiverr Top Rated Seller. Thank you for your comment. I agree. I’m happy to hear that you tried Fiverr and that you were able to get some sales. Thank you for the positive feedback and I’m glad this guide has helped. I hope that you are on your way to become a Fiverr Top Rated Seller. Firstly, congratulations on your Fiverr success so far. It looks like things are going well. Have you been promoting outside of Fiverr on web forums, in landing page communities on blogs in the blog comments or reaching out directly to web design and marketing agencies? You could reach them by sending them emails, doing cold calls, sending faxes (if they use fax machines) or sales letters. You could also run some Facebook or search advertising on your gig to drive more inbound enquiries. I’d also do a search on Twitter, Google and forums to find people that are asking about landing page designs and then you can respond to them quickly. These people are likely to be interested in your service. Everything about your site is so very tasteful. I printed out your article on how to make your first $500 from fiverr.com as I was unsure of how to complete the three different pricing options. I printed out some other people’s info so I can work on in describing my offers. Thank you.